October 8, 2018 – Our time machine travels back to America’s experience in the Great War through the eyes of former president and hero of the Spanish-American War Theodore Roosevelt, whose four sons suited up to fight over there. 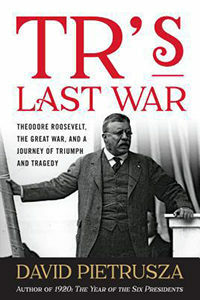 Leading us through basic training is David Pietrusza, author of TR’s Last War: Theodore Roosevelt, The Great War, and a Journey of Triumph and Tragedy . In David Pietrusza’s book, we get a fleshed-out picture of the former Rough Rider — older, suffering in the aftermath of his ill-fated Brazilian expedition, and blind in one eye, but still scrapping for a fight and taking on President Woodrow Wilson. Visit him online @DPietrusza on Twitter and DavidPietrusza.com. John J. Miller – The Big Scrum: How Theodore Roosevelt Saved Football.